Youth leaders from around the world today presented a set of youth-defined recommendations that will guide the UNAIDS Secretariats work on HIV and young people through 2015. 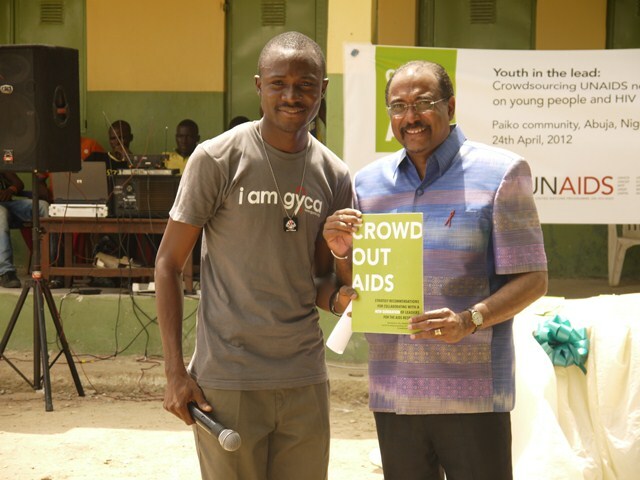 The recommendations were received by UNAIDS Executive Director Michel Sidibé at an event in the Paiko community near Abuja, organized together with Nigerian youth leaders and government officials. Based on the voices and views of more than 5000 young people from 79 countries, the recommendations resulted from CrowdOutAIDS, an innovative youth-led policy project initiated by UNAIDS. Leveraging crowdsourcing technology and new media tools, the five-month project enabled young people to fully participate in the development of strategic recommendations for the UNAIDS Secretariats youth agenda. I am so impressed by the dedication, energy and enthusiasm that young people have shown through the CrowdOutAIDS initiative, said Mr Sidibé. The recommendations they have presented to UNAIDS will help us mobilize a new generation of young leaders and we will work together to stop new HIV infections and AIDS-related deaths. Presenting the recommendations to UNAIDS, Gabriel Adeyemo, a young Nigerian activist, described CrowdOutAIDS as a high level meetingbut by and for young people. It brought decision-making to the grassroots, to the skilled and unskilled, learned and unlearned, rich and poor, to contribute to an issue that affects all our lives: HIV,” said Adeyemo, who is also the West Africa focal point for the Global Youth Coalition on HIV/AIDS. Globally, an estimated five million young people (15-24 years of age) are living with HIV. About 3000 young people are newly infected with HIV each day. According to recent surveys in low- and middle-income countries, only 24% of young women and 36% of young men responded correctly when asked questions on HIV prevention and transmission. 6. Increase young peoples access to financial support. The full set of recommendations are presented in Strategy recommendations for collaborating with a new generation of leaders in the AIDS responsethe first-ever crowdsourced AIDS-related document in UN history. The recommendations, together with an internal organizational assessment on HIV and young people, will inform the UNAIDS Secretariats New Generation Leadership Strategy. Posted on April 25, 2012, in Gender, Women, Girls, Policy, Technology and tagged #CrowdOutAIDS, Abuja, Nigeria, UNAIDS. Bookmark the permalink. Leave a comment.